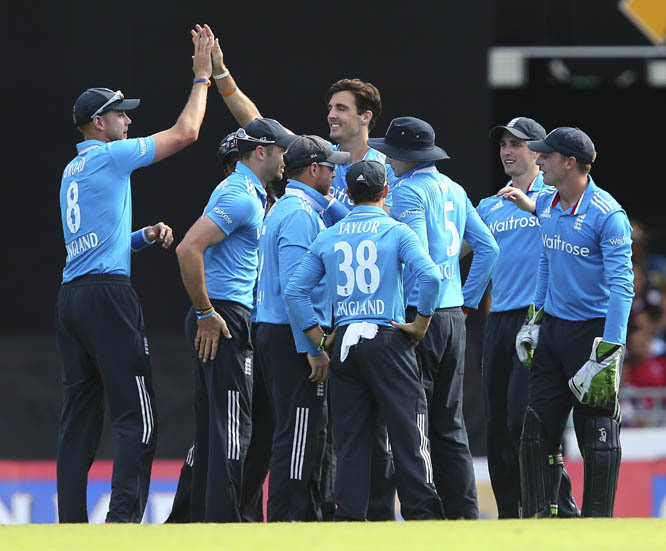 England\'s Steven Finn, center, without a cap, celebrates with his teammates after he got the wicket of India\'s MS Dhoni during the one day International cricket match between England and India in Brisbane, Australia on Tuesday. India's experiments backfired in a big way against England on Tuesday, resulting in a one-sided nine-wicket defeat at Brisbane in Game 3 of the Carlton Mid Tri-series. MS Dhoni's uncharacteristic decision to bat after winning the toss was exploited to the hilt by Steven Finn and James Anderson on a responsive track at The Gabba, which allowed them to share 9 wickets for 51 runs and wrap India up for just 153. The lack of application shown by the Indian batsmen is an area of concern as most of the players got in but succumbed to some poor shot selection. Probably the first time in the last two months, we can safely say that India have been bounced out which again is a wakeup call for think-tank. Shikhar Dhawan again made little impact with the bat as Anderson bowled a beauty to get rid of the left-hander. Ambati Rayadu and Ajinkya Rahane got going with a good partnership but both of them went in quick succession, leaving the visitors in a whole lot of trouble with the score on 67 for 5. Virat Kohli and Suresh Raina did not trouble the scorers much and England by then were all over the Indians. Finn's maiden five-for in ODIs (5 for 33) and Anderson's 4 for 18 was then backed up by a dominating 88* by opener Ian Bell, who added 127 runs in an unbroken stand for the second wicket with James Taylor (56*). England finished the match with a whopping 22.3 overs remaining to win with a bonus point. The only positive for India, who experimented by dropping the in-form Rohit Sharma and offspinner R Ashwin, was the batting of allrounder Stuart Binny who used the opportunity presented to him with an impressive 44*. He also took the only England wicket to fall in a spell of 1 for 34 in 7 overs. Binny added 70 runs with skipper Dhoni (34) but that was never going to be enough to challenge the England side as they got the runs without any hiccups. The Indian bowling again was nothing much to write home about and with England winning with a bonus point, India will have their work cut out in their upcoming matches.